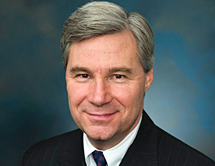 From the "Ocean State" of Rhode Island, Senator Whitehouse has become a major champion of marine protection in Congress. He recently introduced legislation for a National Endowment for the Oceans to be partly funded out of the Restore Act that would direct most of the billions of dollars of Clean Water Act penalties expected to be levied against BP for the oil disaster of 2010 to ecological restoration in the Gulf (see Seaweed Spotlight below). Along with Republican Senator Olympia Snowe of Maine this progressive democrat helped create the bipartisan Senate Ocean Caucus this past year (see Blue Notes # 91), bipartisanship being an otherwise endangered species on Capitol Hill. His depth of knowledge on coastal and ocean issues isn’t hurt by the fact that his wife Sandra Whitehouse is also a highly respected marine biologist.